Precision medicine got off the ground in 2015 with an initiative by the Obama administration. Often described as an update of the concept of personalized medicine, the goals of precision medicine are to develop prevention and treatment strategies for disease that take individual variability into account. The near-term focus is on cancer, and in the longer term, researchers will apply those lessons to other diseases. Cancer is, in many ways, the ideal laboratory for individually tailored therapies, since there is such a large, established knowledge base of the genetic variations within tumors, and of the therapeutic effects of targeting tumor markers. Decisions about cancer therapies are usually made based on what works for the average patient. A precision medicine approach would focus on what therapies work for the specific genetic profile of the cancer. George Poste, D.V.M., Ph.D., chief scientist in the Complex Adaptive Systems Initiative at Arizona State University, was the keynote speaker at the second Precision Medicine Leaders Summit in San Diego in August 2017. The Summit gathered leading researchers, clinicians, and policy makers so that they could discuss how precision medicine should address issues such as pricing, regulation, and access to care, issues that grow all the more pressing as the population ages and chronic diseases and complex medical conditions become more prevalent. Dr. Poste said that the cost of care in the United States is unsustainable and that precision medicine will be crucial in bringing those costs down. For example, immuno-oncology drugs cost $100,000 or more for a course of treatment—and while they have impressive benefits for the 10–30% of patients who respond, they are a waste of money for the remaining nonresponders. Precision medicine requires a great deal of genomic data. Collecting and analyzing those data is an important part of the overall precision medicine initiative. At Geisinger Health System, researchers have been ahead of the game ever since they established the MyCode biorepository in 2007. More than 85% of patients in general clinics have opted in to participate in the repository, and 95% in specialty clinics (from a sample of a total of 36,497 patients).1 The consent for participation was recently updated to allow patients to opt in for return of clinically useful genomic results from research studies, and most patients have also chose to receive these data. Marc Williams, M.D., director of the Genomic Medicine Institute at Geisinger, presented Geisinger’s ongoing progress with MyCode at the Precision Medicine Leaders Summit. He said they have now completed exome sequencing on 92,000 participants. The information is being used for a variety of purposes. “We’re currently assessing 76 genes against 27 conditions,” detailed Dr. Williams. “The ones we’re prioritizing are the ones the CDC says are tier-one genomic conditions.” These genes and conditions include BRCA1 and BRCA2 genes (linked to breast and ovarian cancer), Lynch syndrome (linked to colorectal and endometrial cancer), and familial hypercholesteremia. Results that are returned to patients can be used to modify their care related to their specific conditions. The large data repository also allows the development of treatment options in clinical situations that lack evidence-based guidelines. Large-scale computer analysis, known as machine learning, can be used to extract insights from datasets without prejudice. In the current healthcare system, data are periodic and highly variable. There is no universal, consensus system for collecting data, and that collection depends on the patient’s encounters with the system. Researchers at Duke are working on several large-scale studies and “big data” analytic approaches that can account for that variability and allow for integration not only of data related to the patient’s health, but a patient’s environment and lifestyle factors such as sociocultural norms, education status, and individual choices. For example, Dr. Newby’s group is using electronic health record data to estimate, in real time, the likelihood that a patient who has been admitted to the hospital after a heart attack will suffer a complication. By evaluating risk in this way, Dr. Newby’s group demonstrates how clinicians may provide the right level of care in the hospital. Patients who have heart attacks are routinely admitted to intensive care units for close monitoring. However, only a fraction of those patients actually experience a complication that requires ICU care. 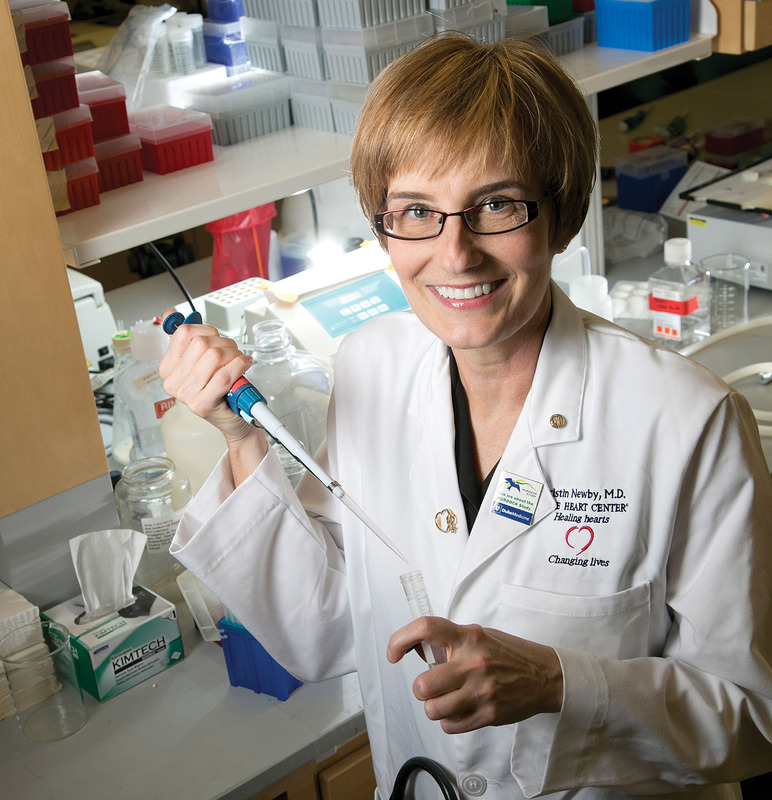 Kristin Newby, M.D., a professor at the Duke Clinical Research Institute, is developing approaches to predict complications in patients presenting with heart attacks by applying bioinformatics and data analytics approaches to patient electronic health records. Precision medicine brings benefits, but also significant challenges for industry. Andrew Zupnick, Ph.D., vice president of oncology strategy at Novella Clinical, said that the industry is facing a need to change in the face of more patient-tailored therapies. One of the challenges is the increased competition in the area of cancer therapies, according to Dr. Zupnick. He observed that personalized medicine cancer trials—those targeting genomic aberrations—have proliferated to the point that it is becoming difficult to find patients to enroll in trials, and companies need to take that into account when designing and planning for clinical trials. As an example, in the area of drugs targeting ALK mutations in non-small cell lung cancer (NSCLC), which only occurs in 3–7% of all NSCLC, there are now four different drugs on the market and a number of next-generation competitors in clinical development. This is a benefit for patients who now have access to a number of targeted treatment options, but companies developing new drugs in that space face a dilemma. In response, some companies, Dr. Zupnick said, are looking at global solutions earlier in development to bolster patient pools, and many are designing flexibility into their protocols, planning for major amendments midstream. For example, if the competitive landscape shifts after a trial has started, a backup strategy may be to transition to the next line of therapy and then work toward a head-to-head comparison once the first line of therapy is already on the market. At the Precision Medicine Leaders Summit, Emmanuel Petricoin, Ph.D., focused on analysis beyond genomics. Dr. Petricoin is codirector of the Center for Applied Proteomics and Molecular Medicine at George Mason University. According to Dr. Petricoin, a genomics-only approach is deficient in its ability to identify all responding patients. He suggested that focusing on protein activation could lead to more accurate analysis. At George Mason, his group is working on that protein-level analysis, as well as combining it with what they call multi-omic molecular profiling (MMP)—including protein expression, protein activation/phosphorylation, and transcriptomic analysis—to select treatments for cancer patients. Dr. Petricoin asserted that his group was the first to use multi-omic analysis systematically in a clinical trial setting. The occasion was the Side-Out Foundation Metastatic Breast Cancer Trial. It featured an application that was enabled by a technological innovation from his laboratory—the reverse-phase protein array. Precision medicine requires that information about a patient’s unique genetic characteristics be available so that it can be used to design therapy. Existing examples of precision medicine occur primarily in the field of oncology, where companion diagnostics are used to direct the administration of drugs such as imatinib and cetuximab. These therapies are directed at somatic mutations. Precision medicine is now being extended to germline mutations. This additional task, like the identification of somatic mutations, requires precision medicine to analyze next-generation DNA sequencing data. Such software-driven efforts can deliver accurate and timely diagnoses. One example cited by Nick Lench, Ph.D., COO of Congenica, is a codevelopment program his company has with Elucigene Diagnostics. Congenica has paired its analytic software, Sapientia, with Elucigene’s cystic fibrosis next-generation DNA sequencing kit to simultaneously screen for more than 250 mutations in the CFTR (cystic fibrosis transmembrane conductance regulator) gene. This allows the physician to evaluate quickly whether a patient could benefit from, for example, ivacaftor, a drug that can restore the function of the CFTR protein in individuals with certain mutations. The drug is currently approved for 38 separate CFTR “gating” mutations. 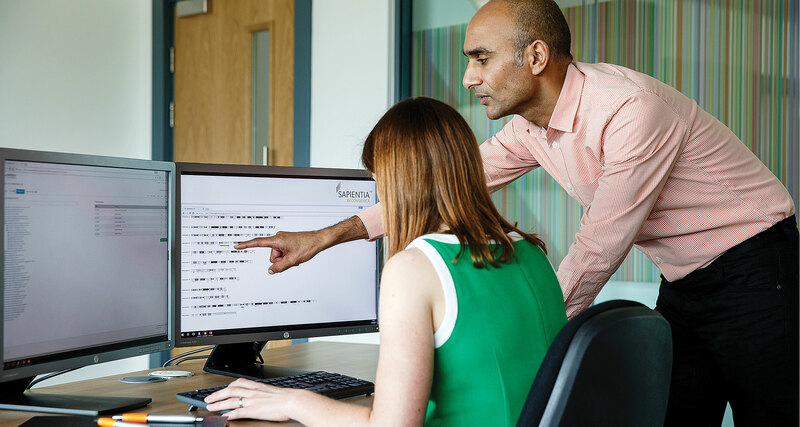 Clinical scientists use Cogenica’s genome-analytics software, Sapientia, to analyze DNA sequence variants in a patient’s genome to provide a precise diagnosis; this information can then be used by the physician to improve personalized treatment and patient management. 1. J.E. Wade, D.H. Ledbetter, and M.S. Williams, “Implementation of Genomic Medicine in a Health Care Delivery System: A Value Proposition?,” Am. J. Med. Gen. Part C (Sem. Med. Gen.) 166C, 112–116 (2014).